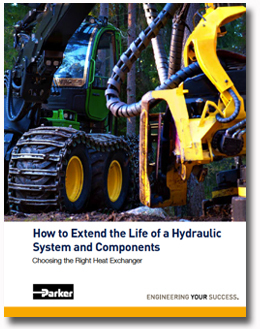 Given the many risks of excess heat in a hydraulic system – such as fluid decomposition, increased wear on system components, damage to seals and bearings, etc. – the need for an effective heat exchanger is an essential consideration. Whether you work with large mobile equipment (such as construction, military, forestry and material-handling units) or commercial/industrial process machinery with hydraulic systems, hot fluid is a concern. A properly sized heat exchanger in any equipment can save time, money and repair headaches. Types of heat exchangers available and the benefits of each. How to select the right heat exchanger by application. Applications and other interactive resources to help determine the best fit for the application. Complete the brief form below and we'll email you a link to the white paper.